Crispy Bell Pepper Oven Fries! Some days you just want an onion ring, you know? A crispy, fried, crunchy onion ring. Or 30. And on most of those days there either isn't viable access to said onion rings or sufficient incentive to fry them up oneself. I've never found a satisfying baked substitute, so yes, my skepticism was running fairly high when I came across this recipe on Delish. Maybe even a little higher than that, so I'm a little bit impressed with myself for trying them anyway. Because they were seriously and surprisingly delicious. 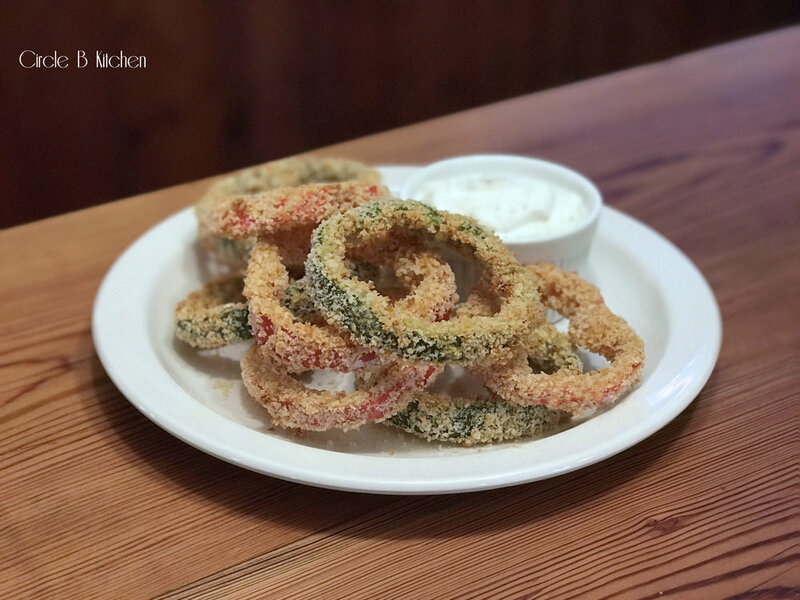 As the peppers bake, they take on that sweetness similar to an onion ring, and honestly, they're way crunchier than you expect them to be, creating this scrumptious bite that begs for another. You can use any color peppers you like, but we're partial to a mix of red and green. In order to turn our pepper rings into "fries", we're going to have to set up our standard breading station (flour, egg breadcrumbs) and give them a dunk and a dredge, and then onto a parchment-lined baking sheet. Preheat oven to 400° and line a large baking sheet with parchment paper. In a medium shallow bowl, combine panko with paprika, garlic powder, and salt. Coat pepper rings first in flour, then egg, then panko mixture. Place on prepared baking sheet. Bake 10 minutes, flip peppers and bake 10 minutes more, until tender. Remove from oven and let cool slightly. While peppers are baking, make dipping sauce: In a medium bowl, combine mayonnaise, sour cream, ketchup, parsley and Worcestershire sauce. Season with salt and pepper and whisk to combine. Serve pepper rings with dipping sauce on the side.